What is phubbing? I’m so glad you asked. You asking that is a sign, a small sign, that you are not hopelessly addicted to your mobile phone. 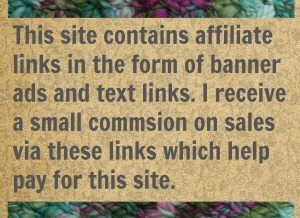 The campaign banner for stopphubbing.com! Yes that is a thing. Click the link to find stats, pledges, and how to stage an intervention. I don’t phub. I knit and that is so much classier. 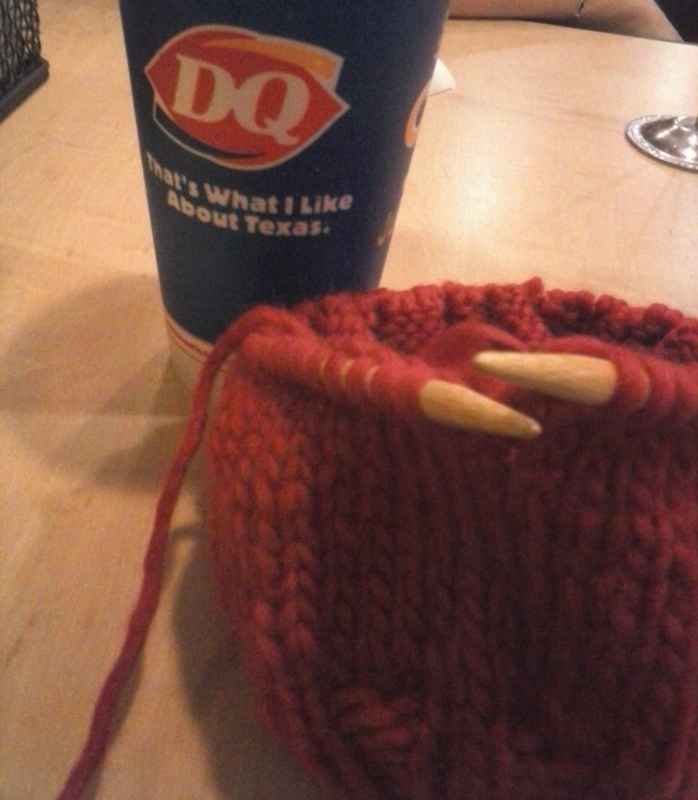 When I’m in a social situation that requires anywhere from zero to half of my attention, I’m knitting. ideally its be easy, brainless, I-could-do-this-in-the-dark knitting. Like a plain old hat. 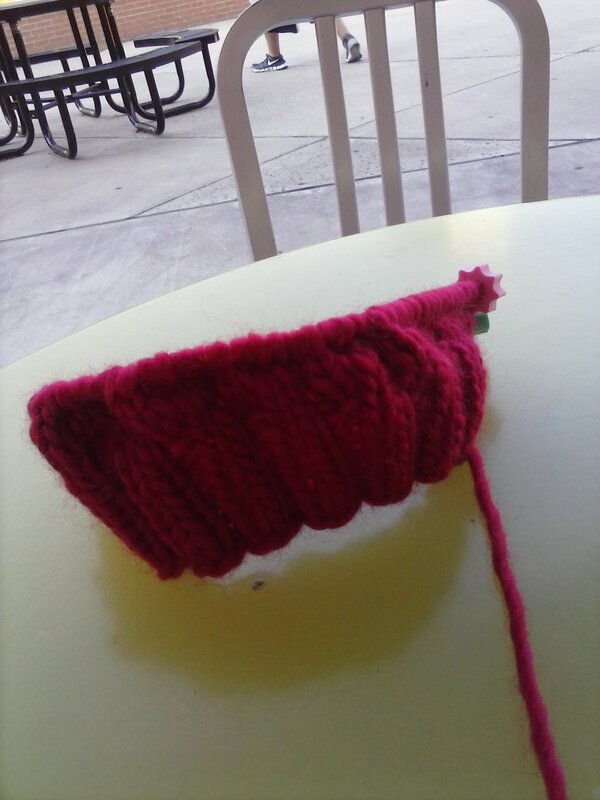 Plain old hats are great for knitting while you are supposed to be paying attention to someone or something. I went to the movie theater this week to watch Tom Cruise perform ridiculous feats of heroism, bravery, and stupidity while saving the world from bad guys that wanted to take over for no explicitly stated reason. I sat in the back, up high and therefore had a great view of everyone staring at their little screens on their phones while the previews scrolled by on the big screen. Those people weren’t just ignoring the advertising that all movie-goers are expected to sit through, they were ignoring the people sitting next to them. They were phubbing. Knitting takes skill. Even the knitting of a plain old hat is something that 95% of the population could not manage for themselves. Anyone and everyone can poke out badly phrased text messages and check their FB page. Knitting has tangible results. When I knit instead of giving someone my full attention I am making something. I’m saying that you, the person I’m with, mean less to me than this future magenta hat in chunky weight yarn. When phubbers phub instead of giving someone their full attention, they got nothing to show for it. They are saying that you mean less to them than the next level of Candy Crush Saga. I can knit a plain old hat while making eye contact with you. That gives the appearance of polite attention. When a bunch of knitters (and crocheters) get together, we look like a happy group of friends who share a common interest and enjoy each other’s company. 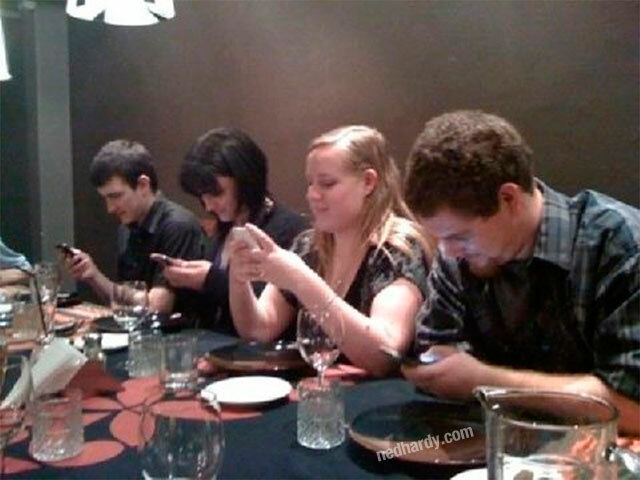 We do not look like a collection of narcissistic tech-addicts who have forgotten how to behave in public. People are dull and the outside world can be a vast mind-numbing waste of your valuable time. We do need something to save us from the boredom of modern life. But if you pick up some yarn instead of your phone you’ll have the advantage. Hands down, knitting in public beats staring into that tiny screen. You’ll come off as elegant, refined, and maybe even artistic. Also, when you are walking down the side walk and you drop your knitting, it will never, ever crack like an egg and leave you wishing you had purchased that cell phone insurance policy from Esurance*. *Cell phone insurance policies are one of the signs of the End Times… right? Yeah I thought so. 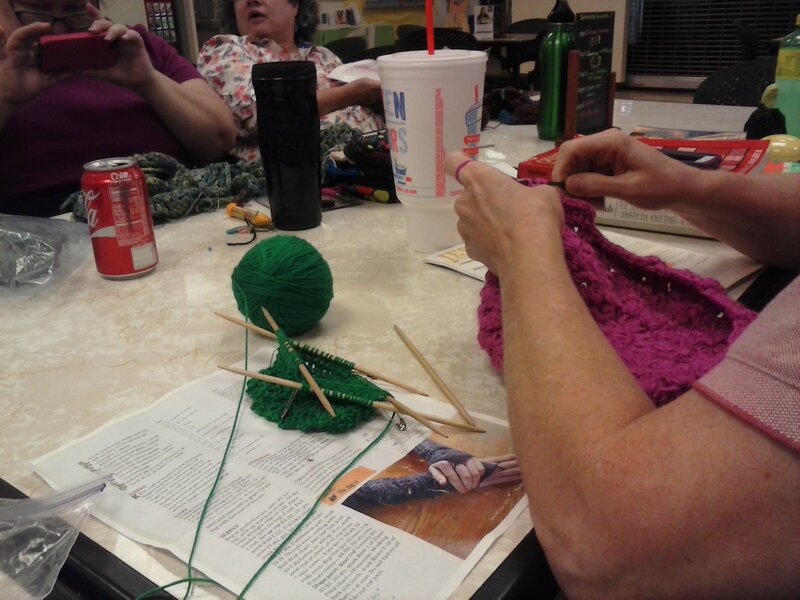 17 Comments on "Knitting Instead of Phubbing"
LOL I love knitting in social situations it helps with my anxiety. Playing with my phone just makes me feel more bored and disconnected. Exactly the same for me. With a project in my hands to hold my attention I don’t have time to get self-conscious! Plus, I’ve noticed that if I text people then tend to txt me back. And when they text me back my phone buzzes. And when my phone buzzes it scares the crap out of me me every single time. Wow you hit upon one of the tops on my pet peeve list. People glued to phones in public especially shopping holding up the checkout line and me goin Grrrrrrr under my breath. Did I mention patience is NOT one of my virtues? I always have a project “to go” bag ready to take when I’ll be sitting with idle hands. Phone addiction is so common I’m surprised that phones don’t have some sort of street-drug-nickname. Maybe they do and I’m just to out of it to have heard. Those people ahead of you in line are probably checking their Instagram feed for fresh pictures of that hot girl who does yoga. I read somewhere that our lives are just a more boring version of our Instagram. I don’t have Instagram and I’d love to say that I never will but I’m sure that one day soon it will be an unavoidable part of modern life. I use instagram for pictures of wips, finished projects, and cat pictures! 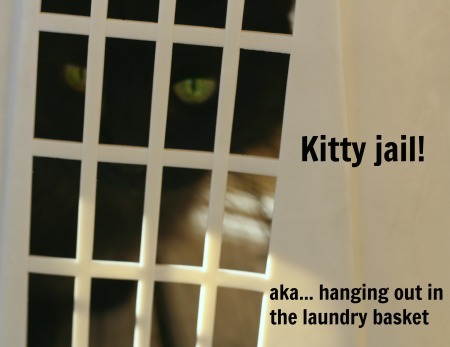 Definitely for cat pictures. If all those with their noses stick in phones were paying homage to cats then it would be perfectly acceptable behavior. Awesome post and makes me realize I need to get back into crafting again rather then playing with my phone all the time, but most of what I do on my phone earns me money *sighs* Still I don’t want to be rude on my phone when I could be crafting something simple and enjoying my friends and family at that time. Sorry this comment took so long to get posted. I found it in the spam box for some reason and you are clearly not spam! Maybe you can find time for both. If your phone earn you $$ that’s wonderful. But crafting can earn you sanity. 🙂 Its definitely worth it. Thanks! Now if you could only use knitting and crochet to combat bad driving….